I have made a number of bad decisions in my life, some of which have come hand-in-hand with my duties here at Asphalt & Rubber. Hindsight is always 20/20, and I can certainly think of a couple machines that I have naively swung a leg over with enthusiasm. Unsurprisingly, the word “prototype”, used in only the loosest of definitions, has been involved in these endeavors. With rare occasion though, I have been able to see trouble coming ahead of time, and have either had the prudence to step out of its way, or the foolishness to forge ahead with a “what could go wrong” attitude. 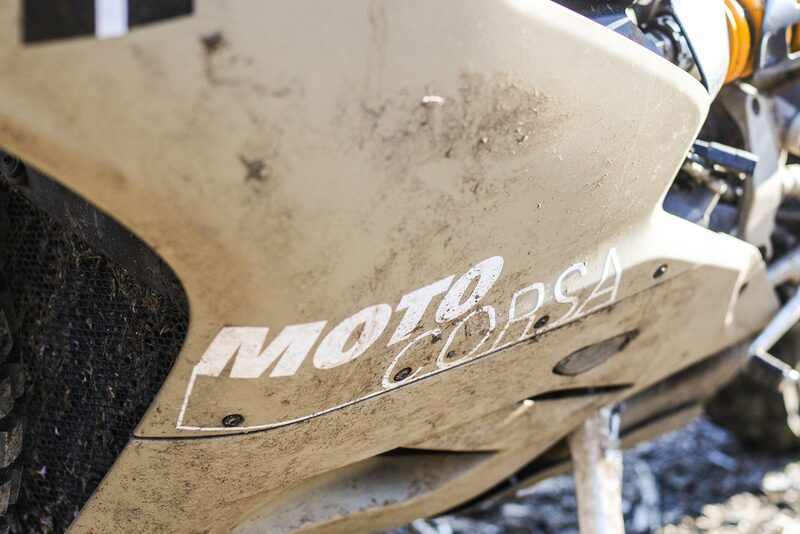 I would add MotoCorsa’s TerraCorsa project to that latter category. 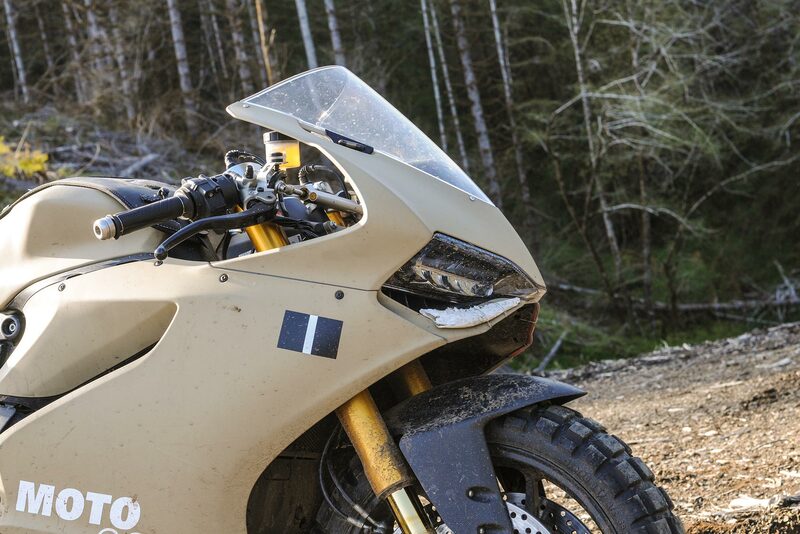 A proper 195hp superbike, designed by Italians to win road races, the Ducati 1199 Panigale is an alphabet soup of features designed to make a rider go as fast as possible on asphalt. 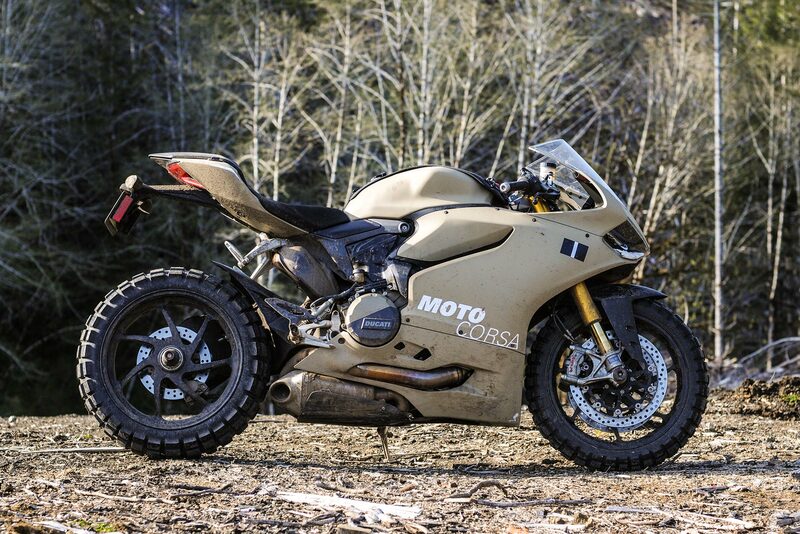 So when MotoCorsa’s Arun Sharma gave me an opportunity to ride his “track bike” Panigale S, which he painted in Desert Storm beige and shod with Continental TKC 80 tires, well…I of course uttered “what could go wrong?” and graciously accepted. 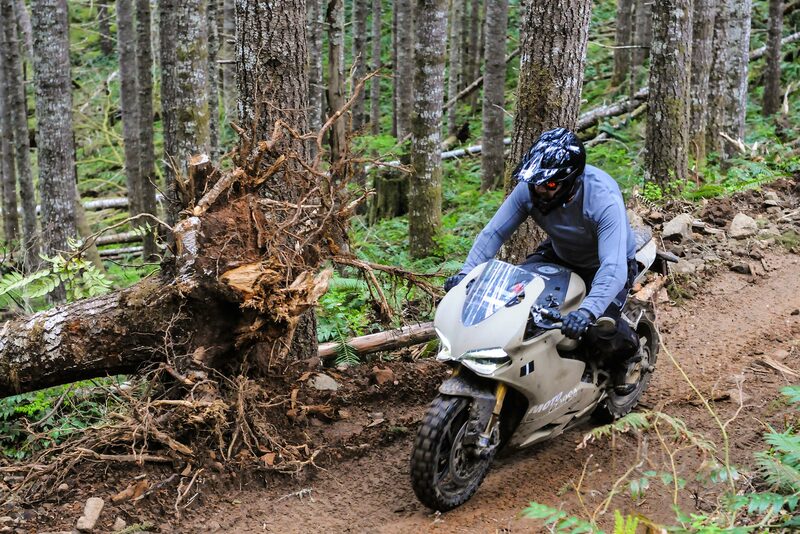 On its face, the whole idea of taking a superbike off-roading is preposterous. No doubt, you are already making a list of all the things wrong with this idea, while pouring a cold glass of Hatorade in the process. And you’d be right in doing so. 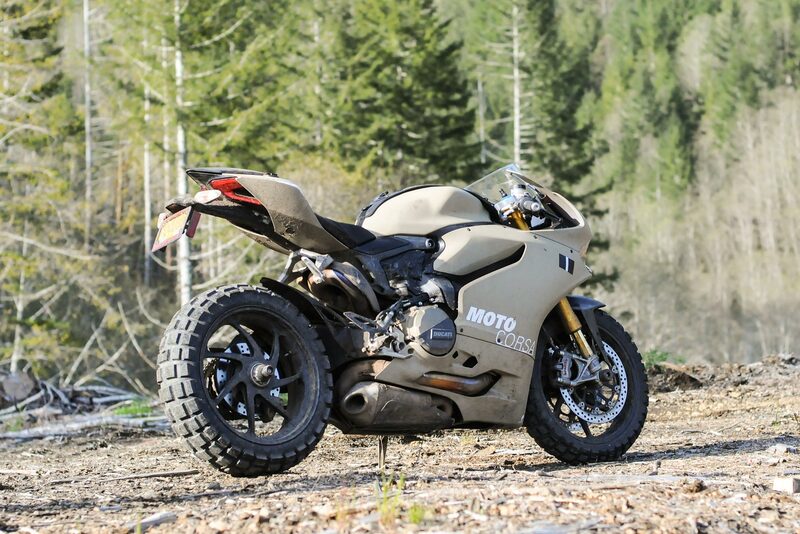 The suspension travel is too short, the Panigale’s 1,199cc Superquadro v-twin engine has too much power, the riding position is all wrong, and let’s just skip over mentioning that the machine is a rolling bone fide crime against motorcycling. 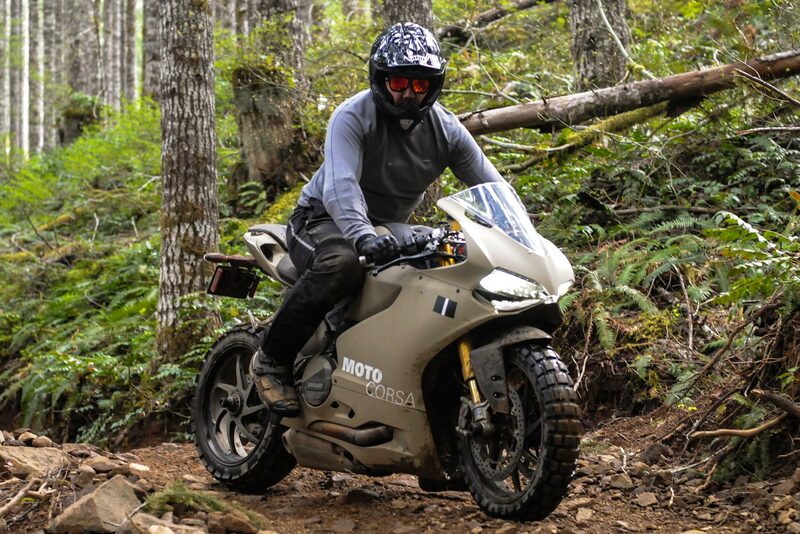 Ducatisti, pour out an espresso for this fallen Bolognese, but be forewarned that Arun and the TerraCorsa feed off the hate that this concept brings. 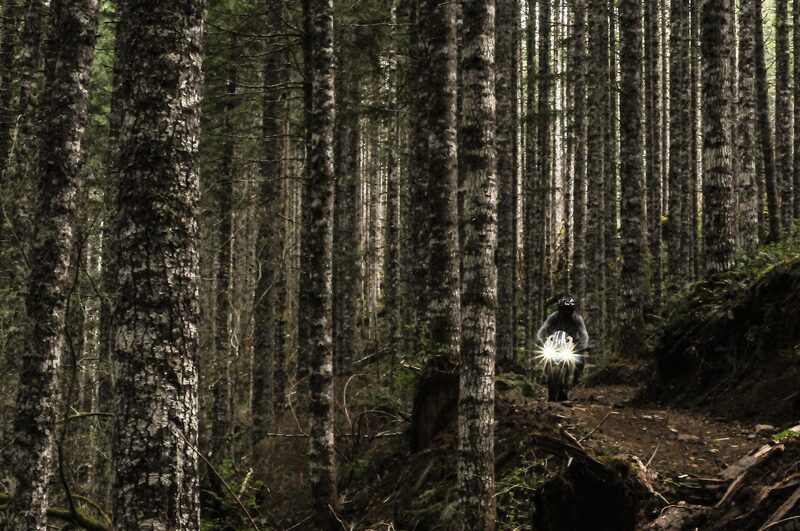 Part of the motivation behind the TerraCorsa is a response to the whole adventure-bike movement. 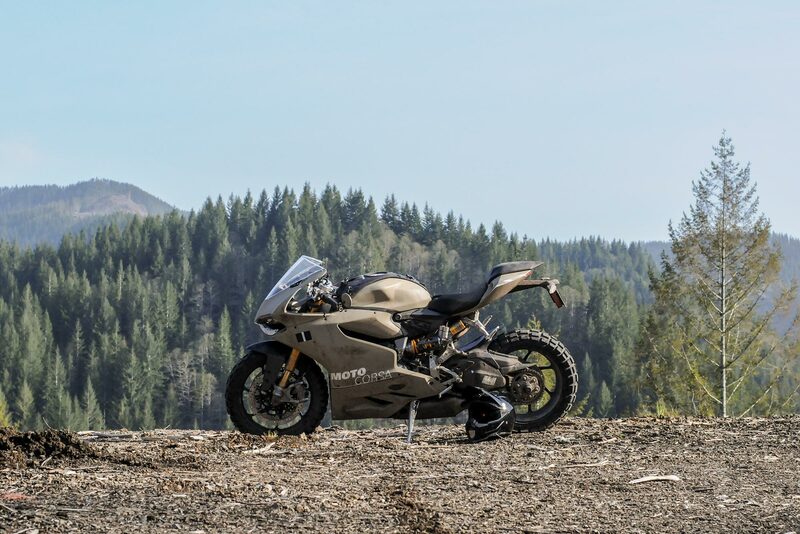 After all, if a 573-pound BMW R1200GSA is the bell of the ADV Ball, then the Ducati 1199 Panigale is positively a supermodel by comparison, what with its 367 lbs dry weight. 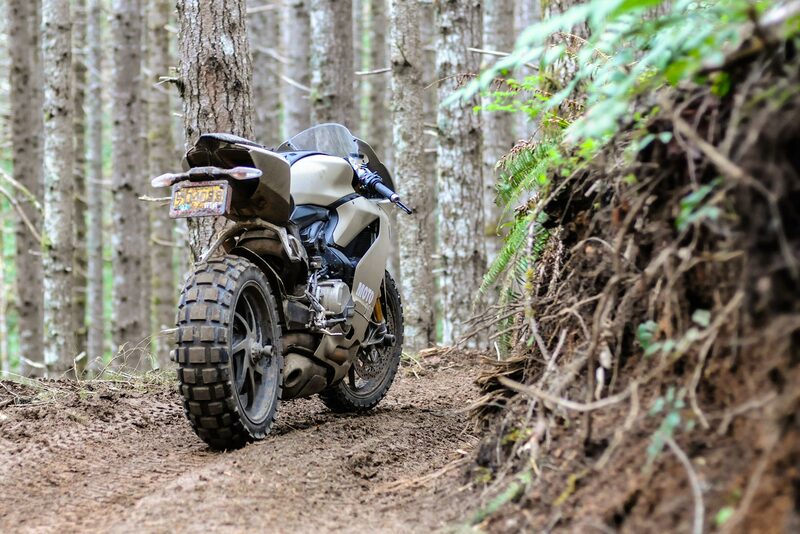 Motorcyclists have this strange notion that in order for a motorcycle to go down the highway, as well as a fire road, double-track trail, or even a mild stretch of single-track through the woods, that the machine in question must be one of these burly ADV bikes — that is after all why the Ducati Multistrada 1200 was made. 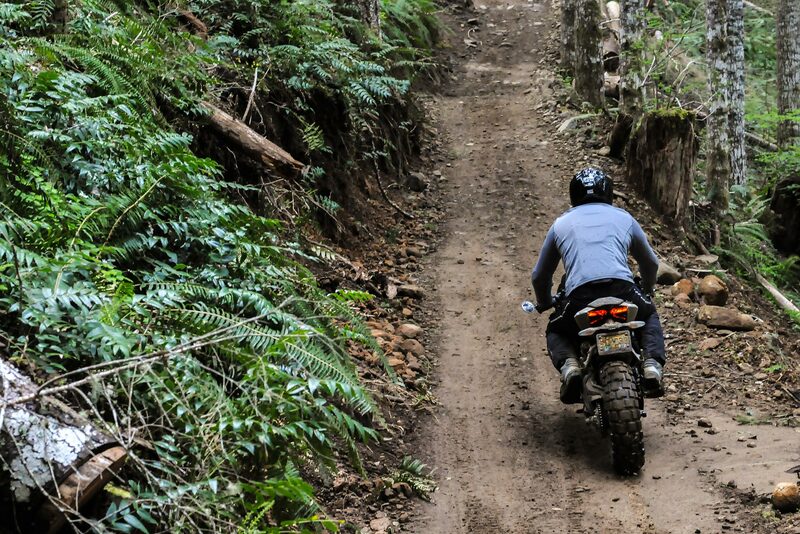 The TerraCorsa is out to prove that theory wrong, and to show that with maybe half an hour’s work, you can go from track to trail with the same machine…and it doesn’t have to be a proper enduro to do so. 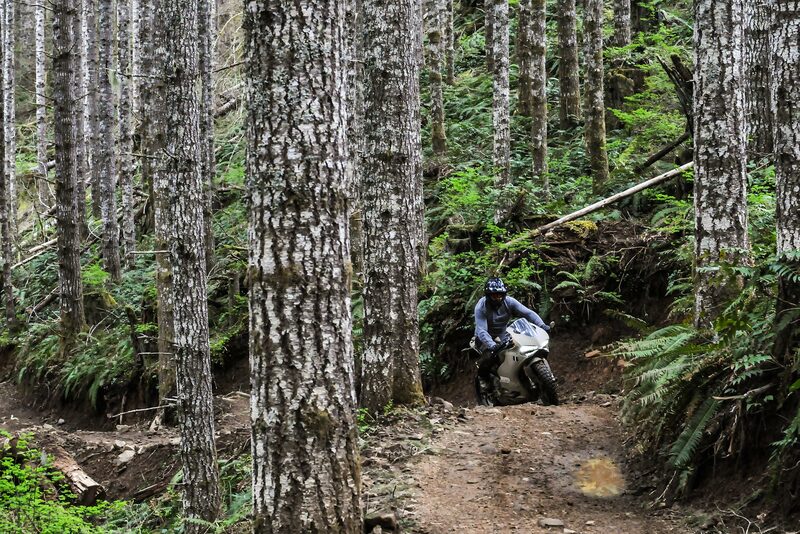 You see, motorcycles are all pretty much the same at their core — an engine and a chassis. 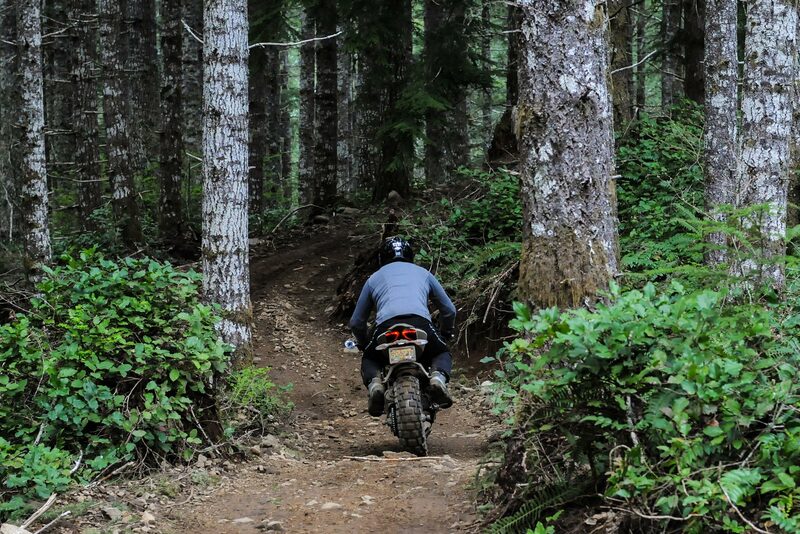 If you look back far enough into history, you won’t see much differentiation between the machines destined for the street and those meant to be ridden off-road (roads back then were practically off-road by modern standards, anyways). 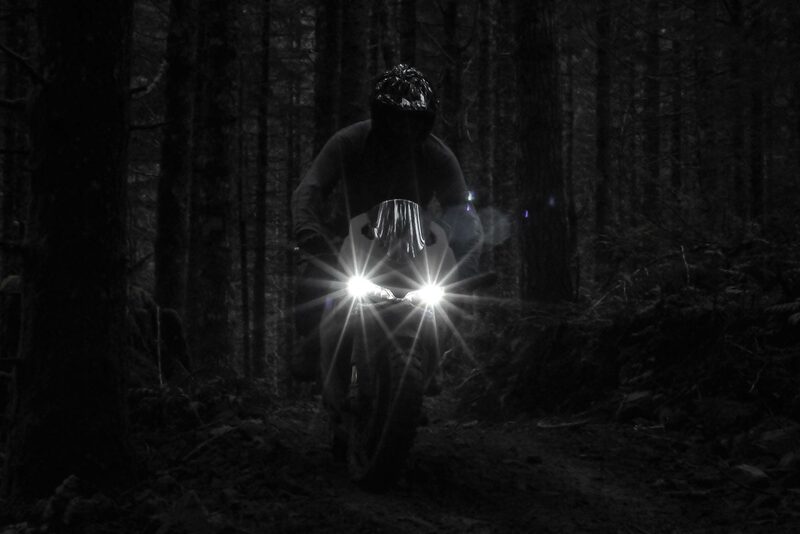 A bike was a bike, end of story. And while I won’t argue that to get the 10/10th’s out of a machine requires some specialization and fine-engineering, the fact is that a pair of tires gets you maybe three-quarters of the way in the direction you’re going. 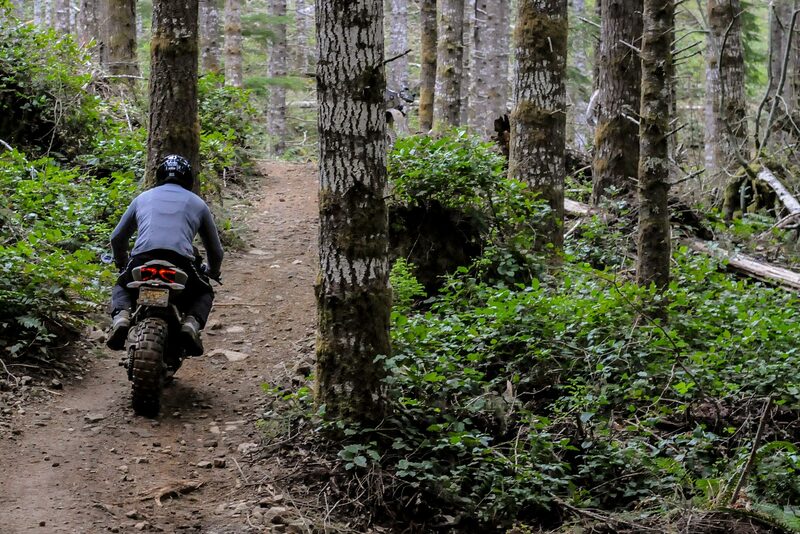 To that end, the TerraCorsa finds itself to be an entirely competent trail bike, by the simple virtue that you can find dual-sport tires for its wheel size. 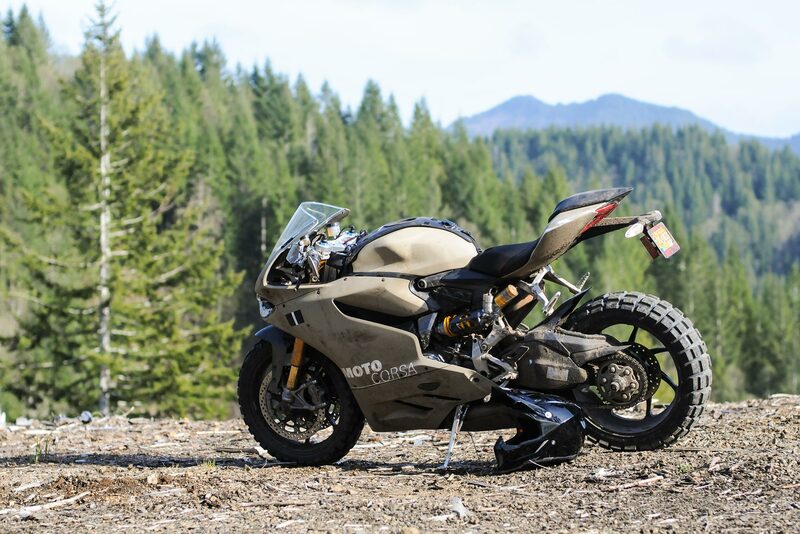 Geared to go nearly 100 mph in first gear, shifting is just something you don’t find necessary to undertake, though I can say with some certainty that the Panigale cooling system does not enjoy being taken through the rev range at such slow speeds. 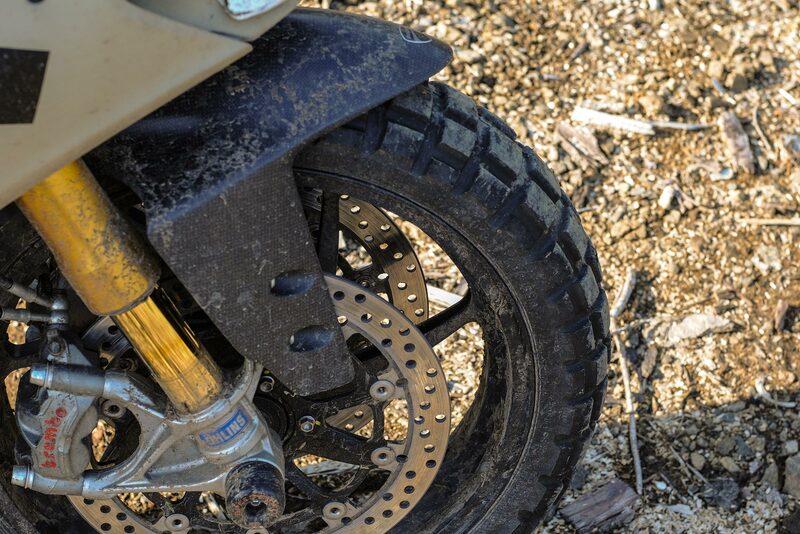 Wearing off-road boots though, shifting becomes a moot point, as the action is just something that can’t be done effortlessly while in a sport-bike position…braking is hard enough really. In some ways though, the cramped seating position of the Panigale is an advantage, especially with the TerraCorsa’s relatively lower weight and seat height, compared to other ADV bikes. 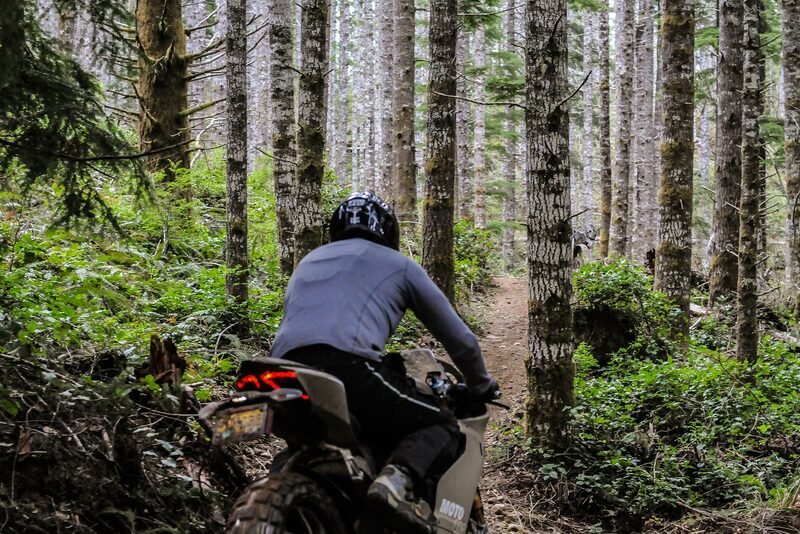 If you have ever stopped on the trail, only to find your legs do not reach terra firma, the TerraCorsa might be for you, as it makes poking a leg out through a turn or a stop, a very confidence inspiring endeavor. 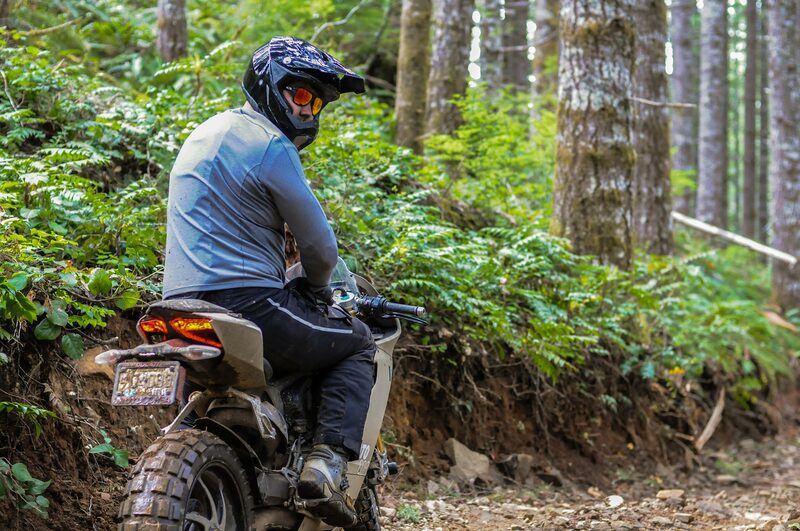 The confidence comes with a trade-off of course, as the 4.72 inches of forward wheel travel (5.12″ in the rear) can be quite limiting, even with the TerraCorsa’s front forks pushed down to the limit within the triple clamps. That being said, the TerraCorsa did not once bottom-out during out testing. 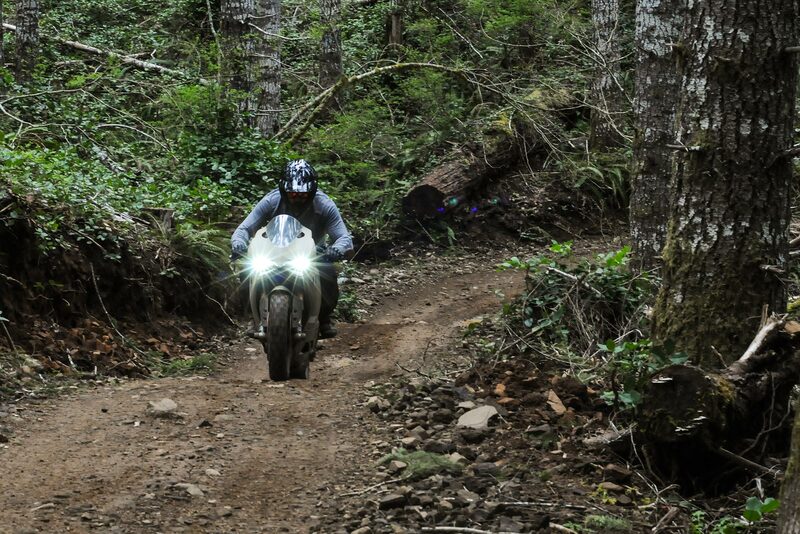 We weren’t bombing around at the same pace we were on proper enduro machines, but we weren’t going slow either. I would argue that the suspension isn’t the limiting factor on the TerraCorsa, but instead it is the clip-on handlebars. 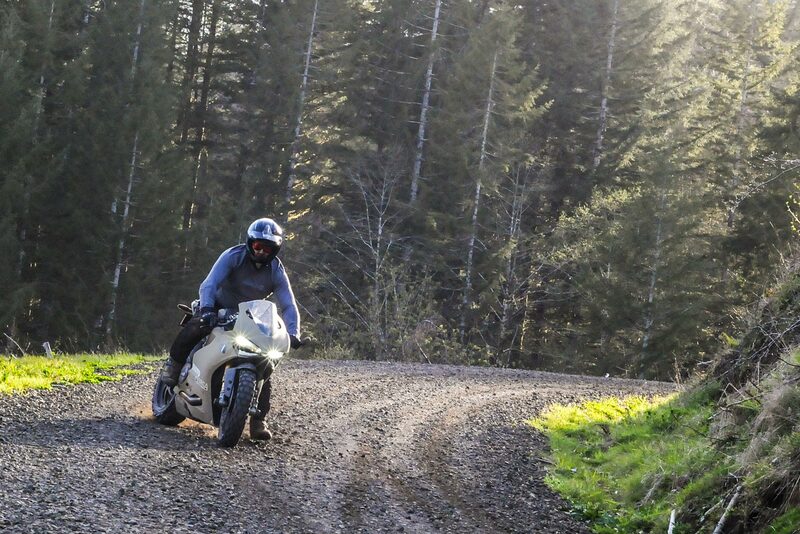 Pushing you far forward into a road racer’s crouch, with your weight already braced in your arms, taking crests, bumps, and yes jumps, is a jarring experience on the TerraCorsa (or any sport bike, I would imagine). A flat bar with a few inches of rise could do wonders for the TerraCorsa, both in terms of comfort and rideability. It would also make turning easier, as I rode in constant fear of pinching a thumb between the handlebar and fuel tank. 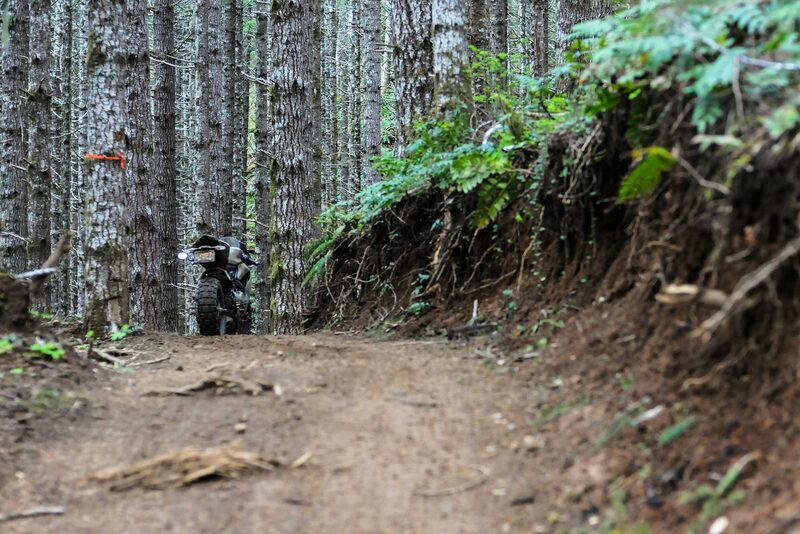 The extra rise would also make getting out of the saddle easier, especially on bumpier sections, and add perhaps a bit more familiarity for the dirt-biking inclined. If all that is the bad, then the good is quite sublime. 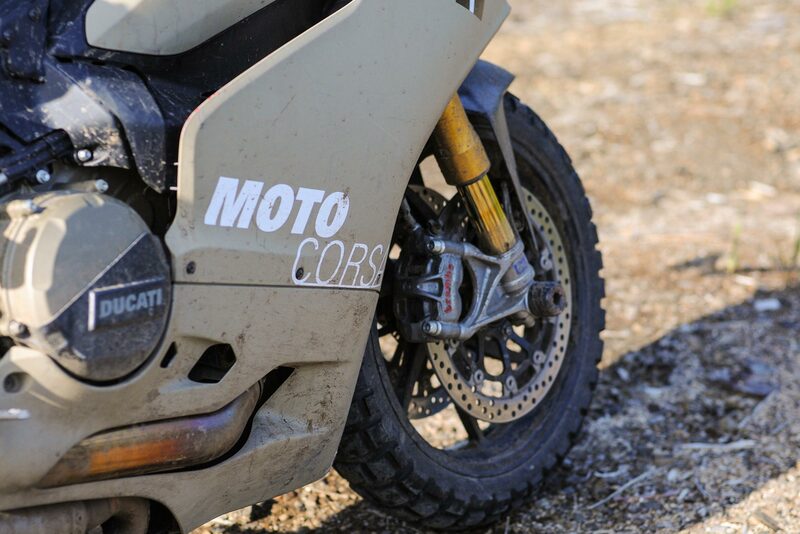 Thanks to Ducati making the Panigale with a near 50/50 weight distribution, the TerraCorsa turns predictably, even in the muddy single-track sections we hit on our first outing. 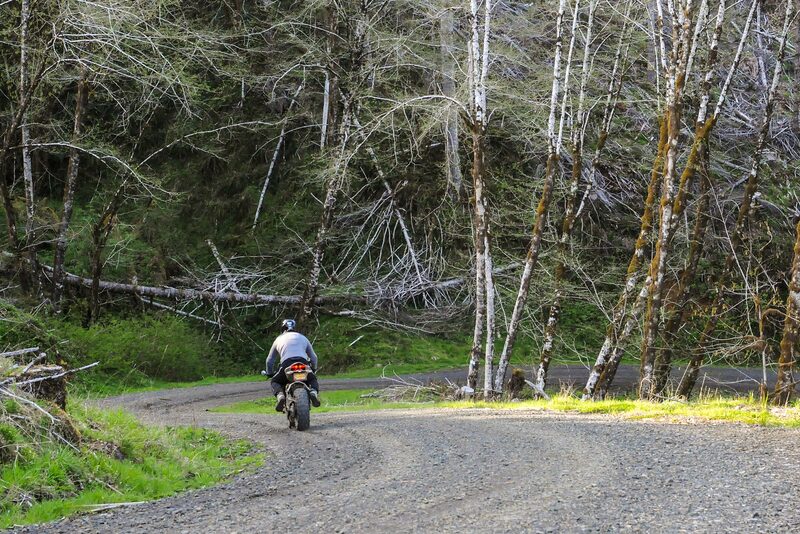 If you have the chance to find an open fire road, ridiculously unsafe speeds can occur, which irked the ire of some Oregonian loggers, but brought a smile to my child-like brain. 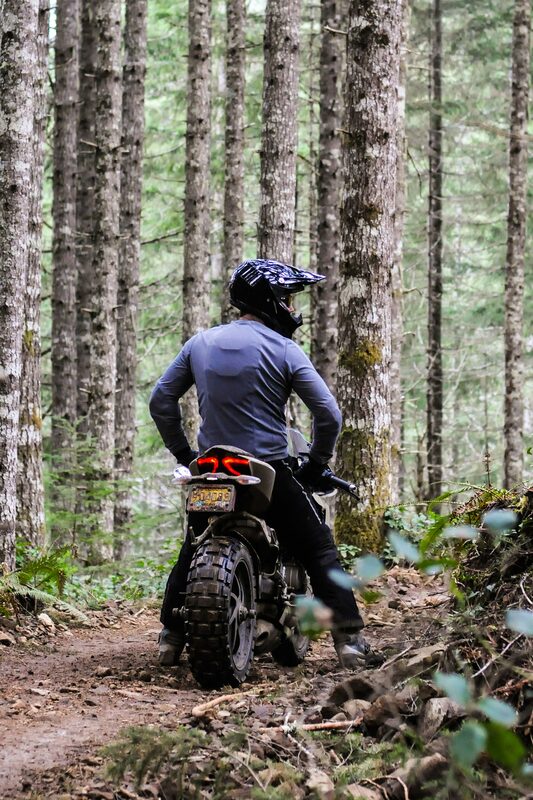 In this regard, the TerraCorsa already fits the bill of many ADV rides, although it does it with far more panache and something resembling stability. Getting your hands dirtier though, one finds that braking the rear loose, pushing the front, and riding with blips of the throttle are hair-raising undertakings on the TerraCorsa, to be sure; but Ducati’s liter-bike is as predictable off-road as it is on the street, and only begs you to explore the limits further with each try. 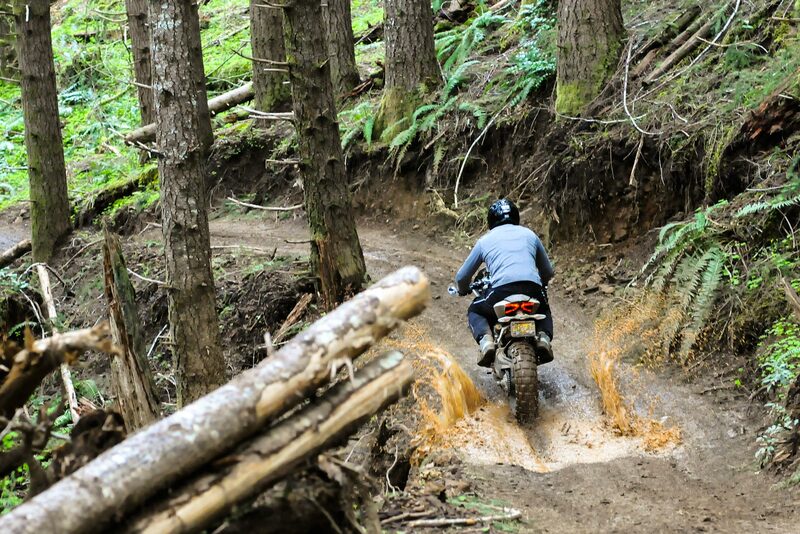 Pretty soon you find yourself railing berms without a second though, and looking for new places to explore the relationship between the coefficient of friction and Newton’s first law of motion. 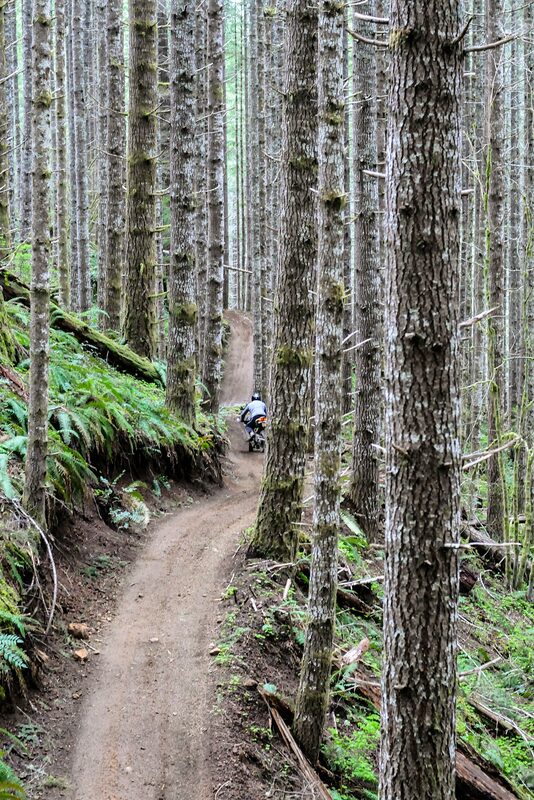 A single-thought summary of riding the TerraCorsa is the pursuit of the ridiculousness. 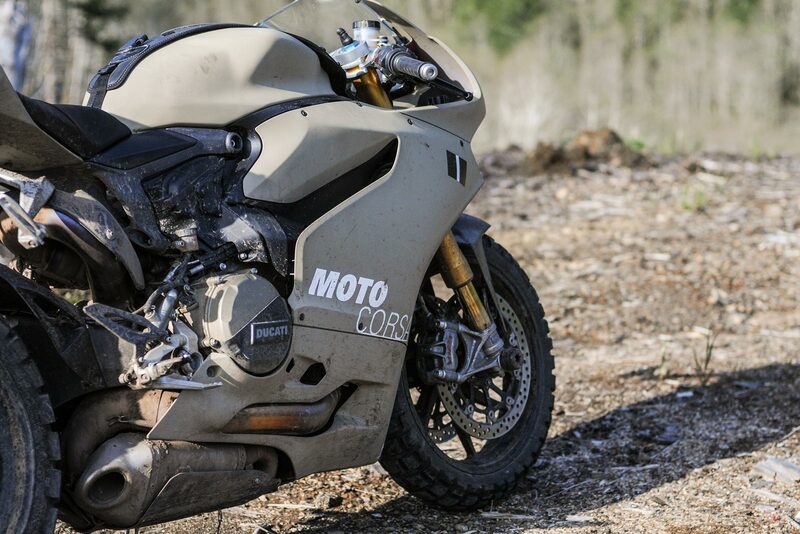 Each minute on this knobbied Panigale is spent finding how far the silliness will go. Can I take that jump? Can I spin it up around this bend? 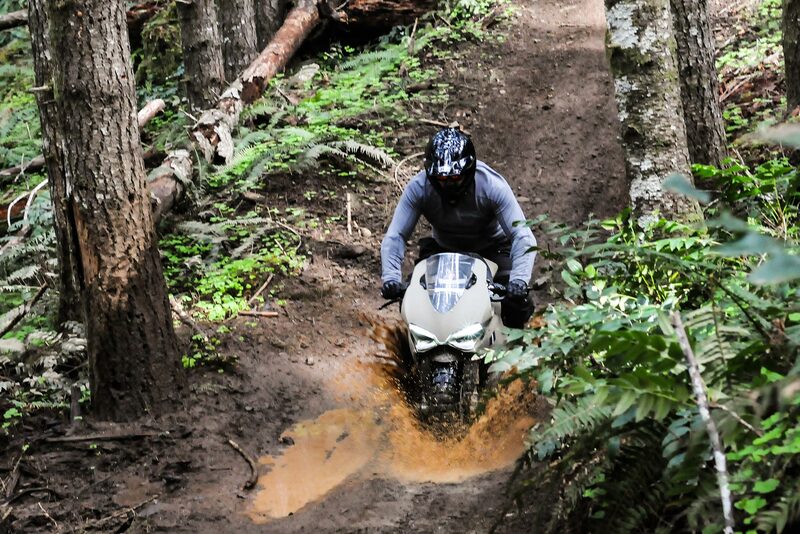 Oh look, a puddle…you’ve never had more fun with your clothes on, unless you’re Mormon. If motorbikes are supposed to be fun, then the TerraCorsa takes motorcycling back to its roots…you know, back when there was really only one type of motorcycle, and you had to ride it in all conditions. 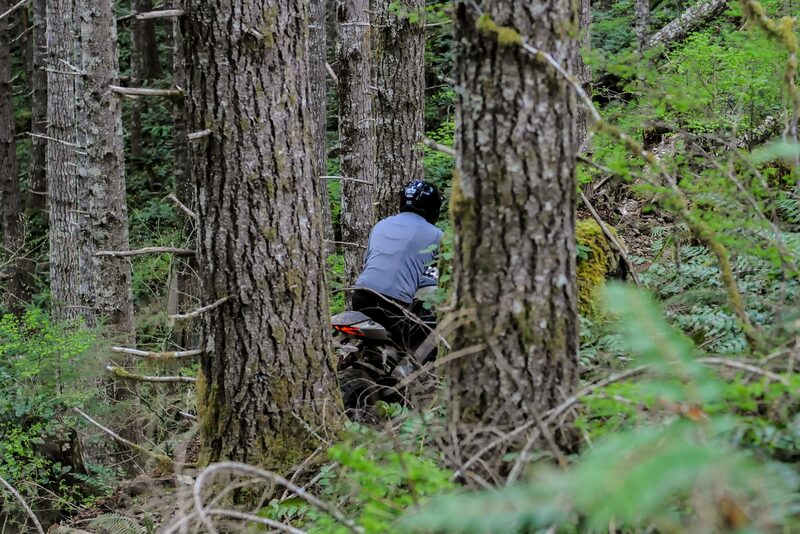 There is a football-in-the-mud aspect to riding this machine…where you know you’re going to get yelled at by mom for doing it, but every minute was worth the endeavor. 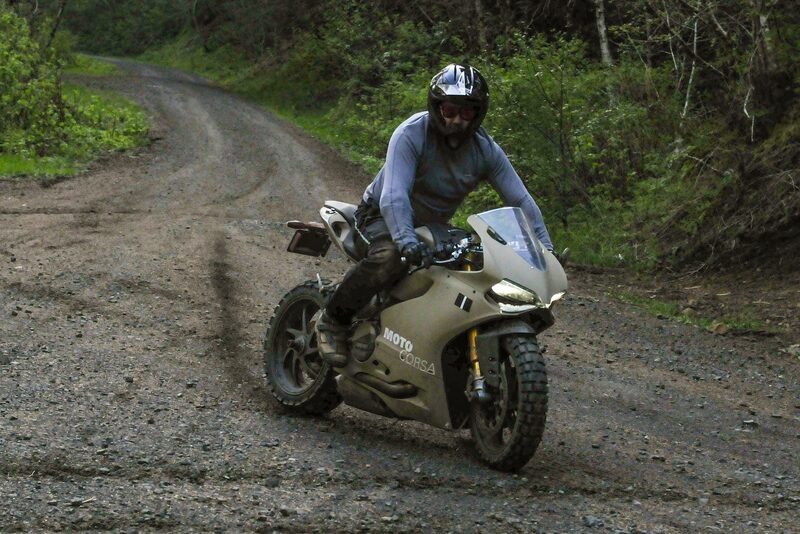 I guess if you were so inclined, you could toggle Ducati’s rider maps and put the TerraCorsa in rain mode, thus sending a slightly more sane 100hp to the rear tire. 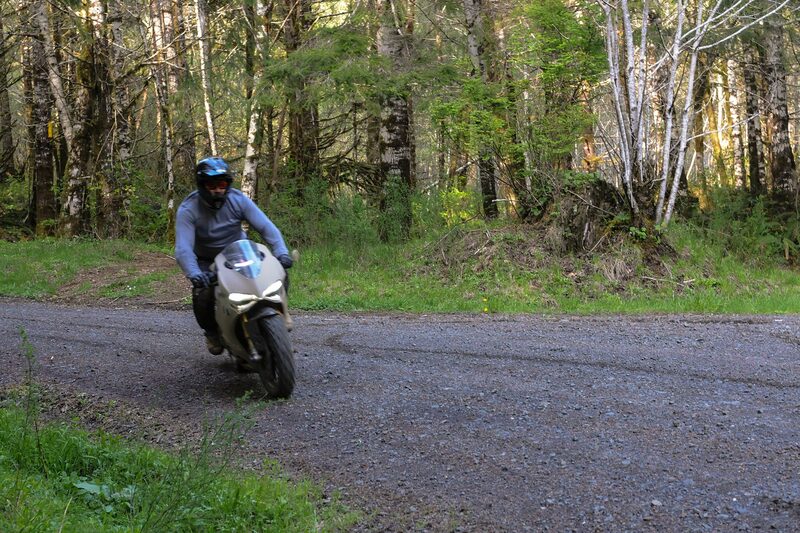 But this is ‘murica, and we like our dirt bikes to have a full 195hp, right? Traction control is for sissies (not to mention completely useless in this application), ABS too. The only thing sophisticated about the TerraCorsa is its khaki outfit, courtesy of a Rustoleum rattle-can. If you want to talk modifications, the list is pretty small. 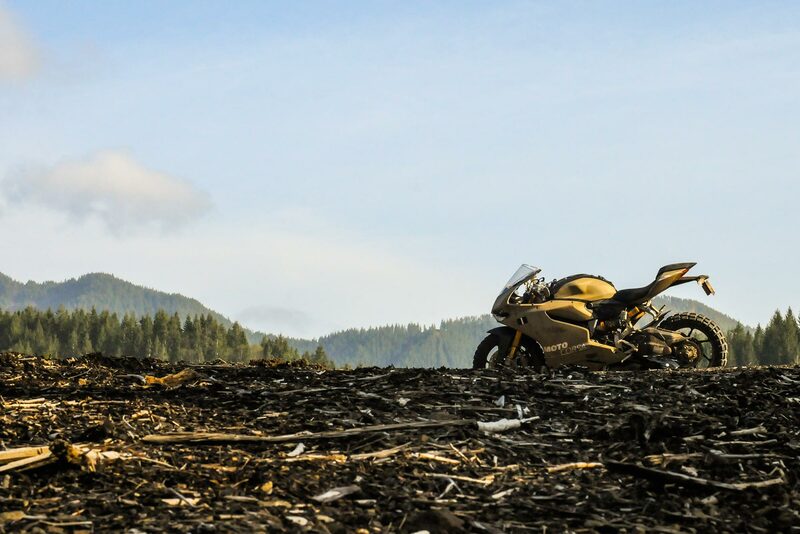 Ducati has used the TerraCorsa to experiment with some different fuel-injection options, but we rode it with the basic Panigale maps. A skid plate has been added, to help protect the Termignoni exhaust system that’s been fitted, and the front fender has been raised to accommodate the TKC’s. 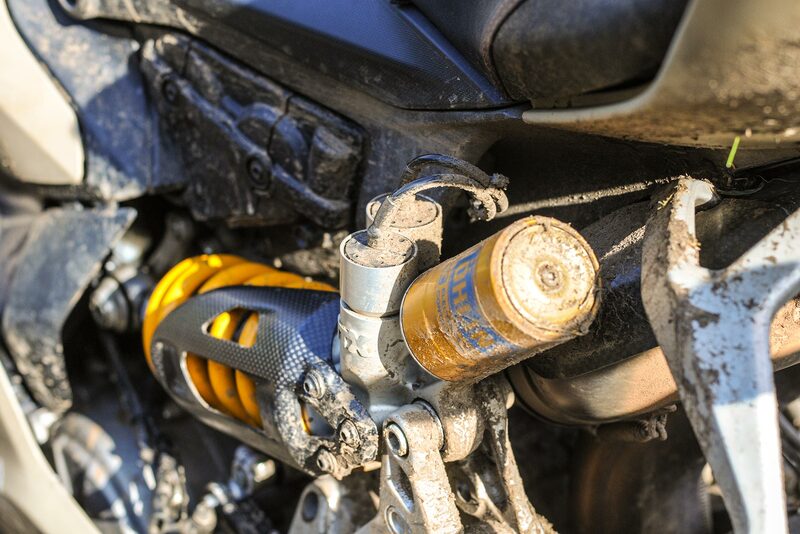 The suspension is the stock Öhlins pieces you’d find on a Panigale S, which is what the TerraCorsa started life as originally. A bar end mirror replaces the stock units on the fairing, and then of course there are the knobby dual-sport Continental TKC 80 tires. It’s a simple recipe, really. 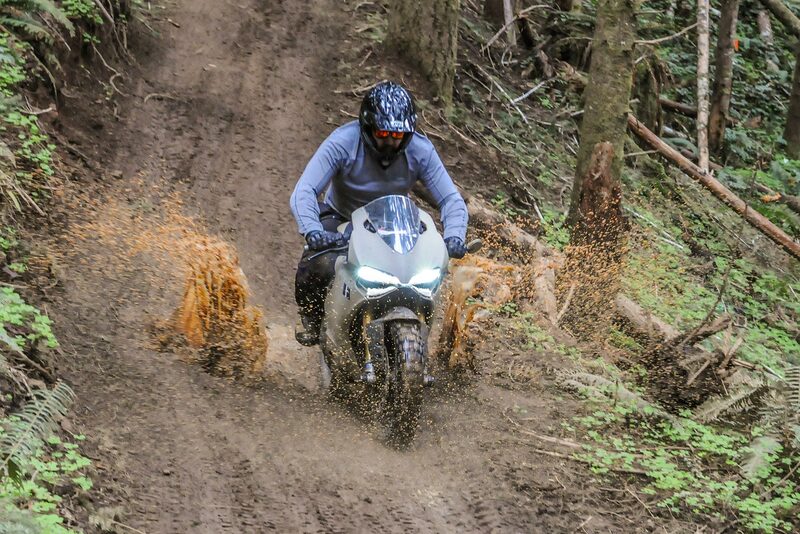 You may have already seen MotoCorsa’s TerraCorsa at events near Portland, Oregon, like the One Show, Alley Sweeper Ride, or Dirt Quake USA. 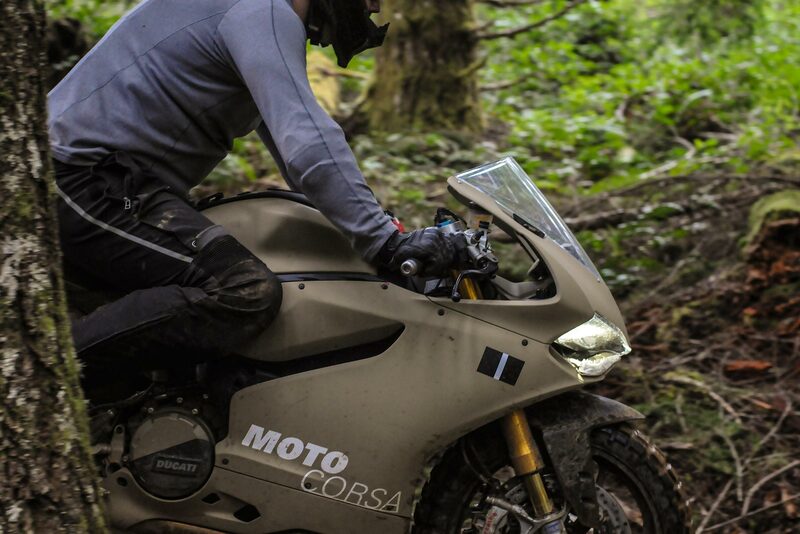 You can also find the TerraCorsa in its more native habitat, like a Portland International Raceway track day, or its domicile at the MotoCorsa dealership. Interested in joining the fun? It’ll cost you about $300 in tires. 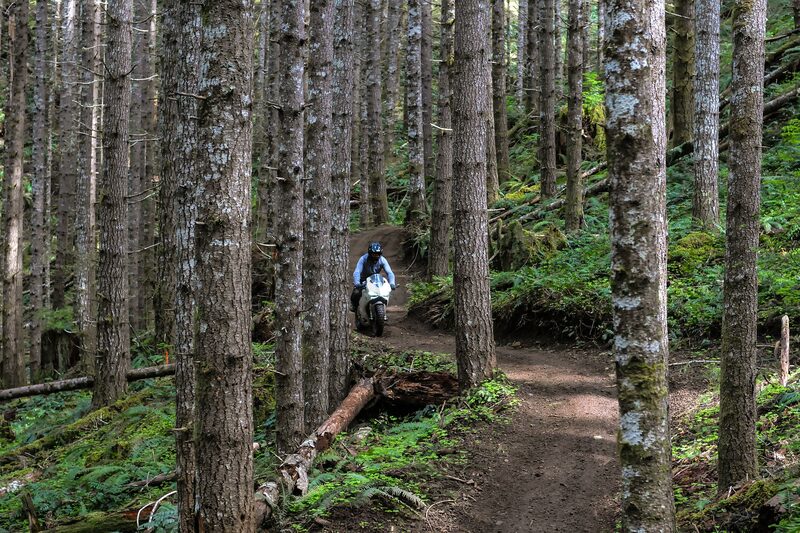 I doubt we’re going to see ADV riders trading in their two-wheeled couches for a sport bikes with knobbies, I haven’t completely flown over the cuckoo’s nest after all. 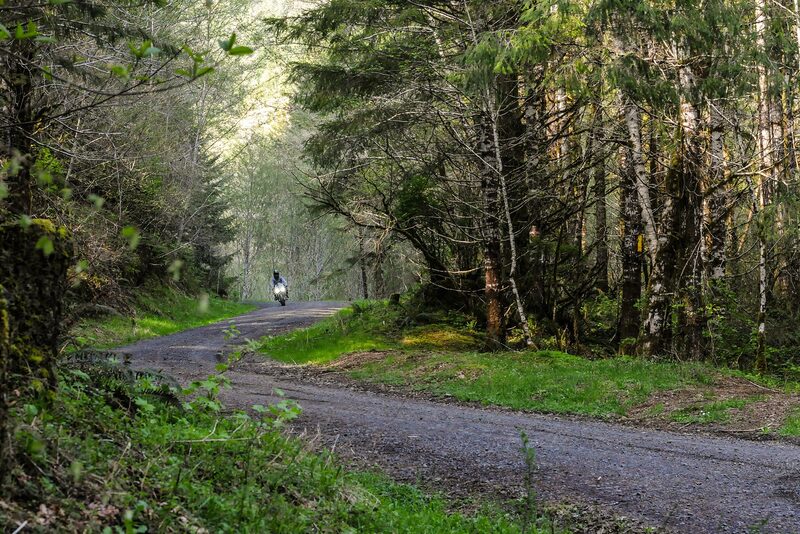 But, I hope bikes like the TerraCorsa inspire street riders not to fear a path less followed. 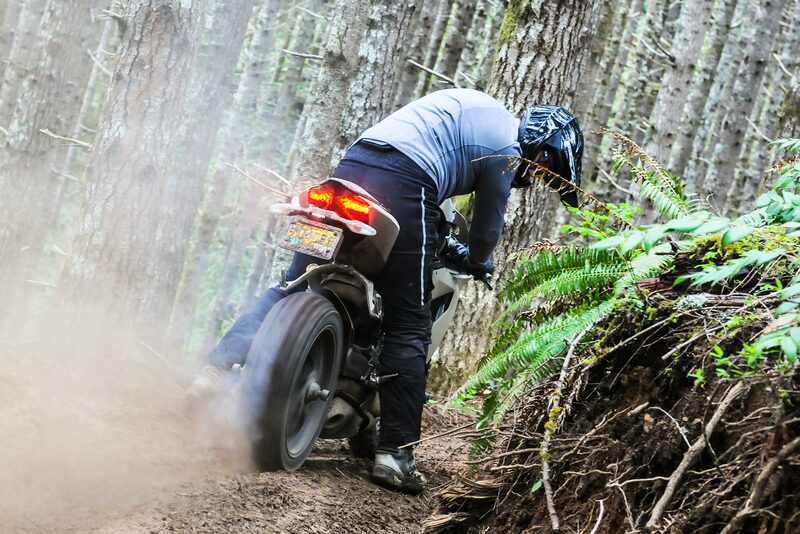 You would be surprised by what your Street Queen can handle off-road, and you will be even more surprised by how much fun you will have in the process.